When I decided to expand my research from a focus on Paris to include Capri as well, I didn’t realize that this path would eventually bring me back home to New York. But Rose O’Neill, designer of the kewpie and former “Queen of Bohemia,” showed me the way. Historians, as a group, tend to be splitters not lumpers (although, as is obvious from this sentence, I sometimes deviate from that rule). The principle of historicism that guides our discipline teaches the specificity of different times and places; rather than look for continuities, we emphasize the difference of past moments. As a result, academic history can seem bewilderingly specific to non-historians. I wrote my first book on American reactions to the violence of the French Revolution, and by the standard of first books this was a broadly-conceived project! One of the most important criteria that historians rely on to split the past is the nation. Open any university catalogue and you will discover a list of classes organized by country and chronology (U.S. History to 1865; Nineteenth-Century France). Transnational historians often try to broaden their projects by bringing two places into relation with each other (as I did with the United States and France in my first project), but nation remains a critical category in their approach. Following this practice, I began my current research by asking questions about how Americans learned to cook in France. But my reading soon took the project in new directions. As a resident of British Columbia, I couldn’t resist reading memoirs by Canadians in France, like John Glassco and Morley Callaghan. And if I was reading Canadians, how could I resist British memoirists, who traveled in the same Anglophone circuits? 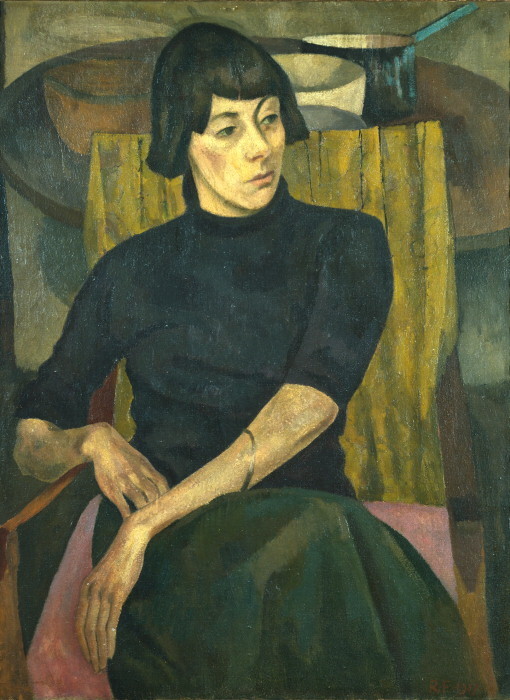 Especially when those memoirists were intriguing women like the bisexual, heavy-drinking, Welsh artist, model, and writer Nina Hamnett, also called the “Queen of Bohemia”, who died after falling forty feet from a window and becoming impaled on a spike? Adding Capri to the mix, and reading the international band of memoirists – like the Swedish Axel Munthe, the Australian Shirley Hazzard, and the Anglo-German Norman Douglas – who lived there, my project soon seemed to jump the bounds of nation altogether. My peripatetic subjects, who moved incessantly from place to place (Paris! Capri! London! Florence! Rome! Lake Geneva!) required a spreadsheet to keep track of their wanderings. And before long, I had a column titled New York. Djuna Barnes wrote Nightwood, about her love affair in Paris with Thelma Wood, while visiting England, before moving to Greenwich Village, where she lived out the end of her days in a tiny apartment on Patchin Place. M. F. K. Fisher spent years in the city, between her sojourns in Dijon, Vevey, and California. And Rose O’Neill, a frequent visitor to Capri and Paris, who ended her days in the Ozarks, spent the majority of her life living close by Barnes, just off Washington Square. O’Neill, who was an illustrator and writer, is famous for the kewpie characters she created – cutesy baby cupids who appeared in cartoons doing good deeds, and whose popularity launched a merchandising craze that made O’Neill a very very wealthy woman. There were kewpie dolls, natch, as well as soaps, cards, and salt and pepper shakers. And then there was the Kewpie Jell-O cookbook. 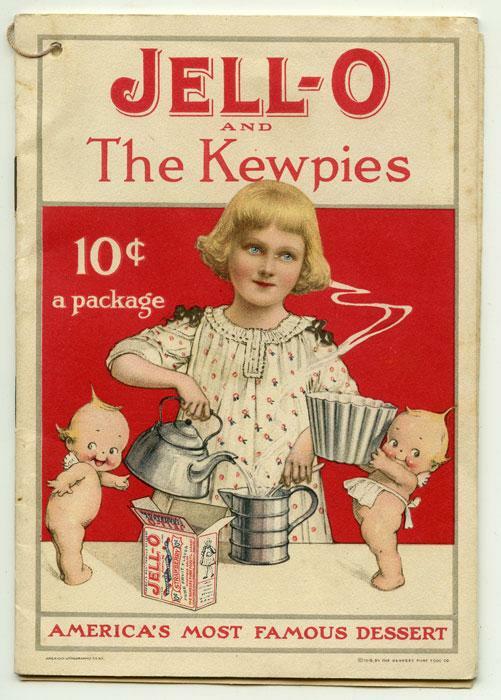 Jell-O and the Kewpies: could a more domesticated pairing be imagined? What could the illustrator of Jell-O and the Kewpies have in common with Nina Hamnett? Or with any of the many other women who shared the title “Queen of Bohemia,” including the bisexual, hard-drinking, feminist, Marxist journalist Louise Bryant, and Kiki de Montparnasse, the artists’ model, muse, and renowned party girl who befriended many expats of the Lost Generations? In fact, the seeming sentimentality of O’Neill’s kewpies bore little in common with the avant-garde life of their inventor. A passionate advocate for woman’s suffrage and dress reform, the beautiful, sociable, and voluble O’Neill declared herself “withdrawn from marriage” after her second divorce in 1907, and directed all the profits from her designs to supporting an artistic community of friends and lovers, and to living a life of pleasure, sociability, and free love, based in Greenwich Village. O’Neill’s social world gathered around the table she endowed at the Hotel Brevoort, on the north side of Washington Square Park, at 5th Avenue between 8th and 9th streets. 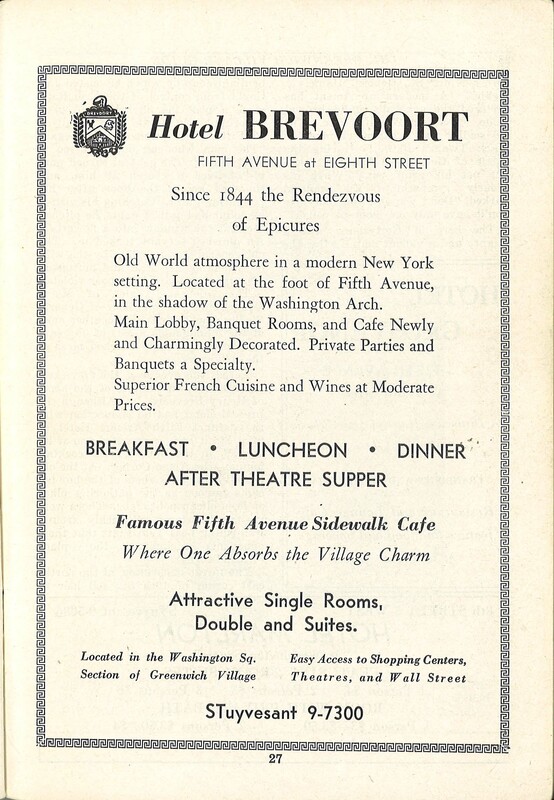 Among other amenities, the Hotel Brevoort offered the first “Parisian style” sidewalk café in New York City, and the hotel’s French owner, Raymond Orteig, hired French chefs to make his restaurant the “Rendezvous for Epicures” from around the world. 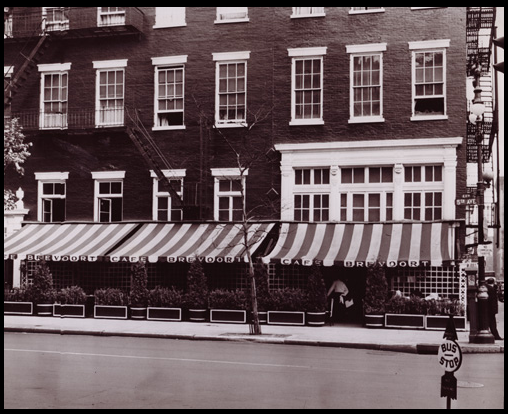 This strategy proved so successful that the Brevoort attracted a clientele ranging from foreign aristocrats to Bohemians like Edna St. Vincent Millay. The café had a permissive reputation, which strengthened its association with Paris culture. Friends held a fundraiser there for Margaret Sanger in 1916, the night before her federal trial for sending “indecent” information about birth control through the U.S. mail. And Rose O’Neill kept a table at the restaurant in her name where her artist friends, when down on their luck, could drop in for a free meal. The incredible value that O’Neill placed on sociability, spending so much money on wining and dining her friends that she was eventually bankrupted, marks hers as a true Bohemian life. To use more contemporary language, O’Neill’s lifestyle was as queer as Nina Hamnett’s and Louise Bryant’s, whether or not she included women lovers along with the men. She rejected marriage and motherhood in exchange for friendship and fun. She was ebullient and gay – in the old-fashioned sense of the word. She liked to drink and eat, and for others to share those pleasures with her. She bought a mansion in Connecticut (which once had a big Bohemian community) where penurious friends stayed for years at a time. 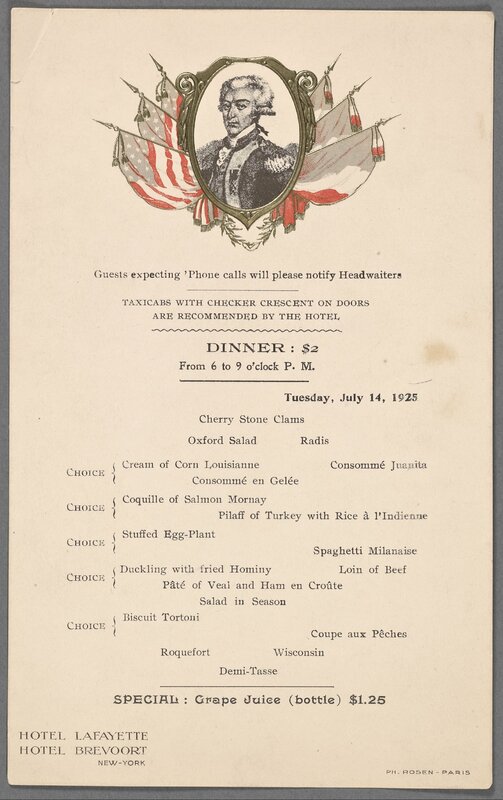 Café Brevoort Menu. Note the “special” of grape juice served at this prohibition-era Bastille day meal. 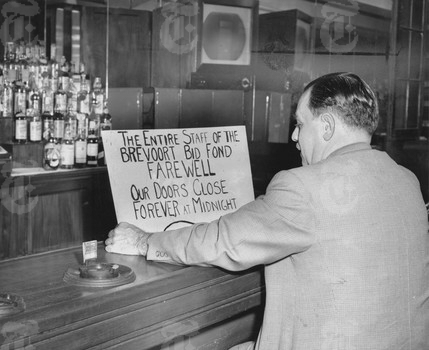 Thankfully, she was ten years in the grave when the Brevoort Hotel, along with its café, were torn down in 1954 to make way for a new apartment building with more modern amenities (now a luxury address that has been home to Judge Judy among other celebrities). The artistic crowd who used to haunt the Brevoort’s tables wandered to other establishments, like the nearby Cedar Tavern, famous watering hole for the Abstract Expressionists, and a place I loved to hang out in during high school. Back in the city for a month last summer, I noticed that the Cedar Tavern is gone now too. It’s easy to feel nostalgic for its passing and for a Golden Age of New York Bohemianism that used to be. Rents being what they are now, what struggling (or not so-struggling) artist could afford to live in the city? But, as I’ve written elsewhere on this blog, complaints about the passing of a Golden Age are nothing new. A 1918 guide book to Greenwich Village included on its title page the adviso that “whatever else Bohemia may be it is almost always yesterday.” Floyd Dell, who moved to the Village in 1913, claimed that he had arrived “before the invasion of the barbarians from Uptown, before Pepe raised the rents – the Golden Age.” Staking his claim to primacy, Dell rhapsodized “I was among those present at the opening of the original (and how different!) Polly’s restaurant on MacDougal Street.” Those were the days. Dell’s reminiscences about the Village before it was ruined sound familiar from countless conversations I’ve had with people my age who grew up in the city, or folks like Le Rosbif, who moved to New York in the 80s. Dell writes, “In those old, forgotten, far-off days, the Village was truly a village. Artists and writers lived there because their rents were low, and one could get a floor of great rooms with high ceilings and tall deep-embrasured windows (giving a true north-light) for I dare not say how little money.” Don’t let Le Rosbif get started on the apartment he used to rent on 3rd street between C & D back in the day. Growing up in New York in the 80s, I never considered myself as living during a Golden Age. Far from it – the Golden Age existed firmly in the past. In 1977, the year that New York City went bankrupt, my parents split up and my family returned from our brief sojourn in the suburbs to re-establish lives in the city. The eighties I remember were filled with de-institutionalized schizophrenics fighting drug addiction on neighborhood streets, and preppies cashing in on Wall Street. My older brother (and hence myself) idolized the 60s, when the Village was a Bohemian epicenter. Only now, thirty years later, have the eighties begun to twinkle in the dim light, as a time when my divorced mother could afford a two-bedroom apartment in Brooklyn on a public servant’s salary, when the Beastie Boys were playing at CBGB’s, and when a Cuban sandwich that could stretch for two meals cost only $2.00. “I recall with intense amusement the New York restaurants and cafés of a quarter of a century ago,” wrote James Huneker in the New York Times in 1914, “Were they any better than now?” Huneker thought so. He fondly remembered a café run by Billy Moulds at University Place, near Washington Square, where he used to eat back in 1886 when he first arrived in town. It was a center for artists, writers, actors, and musicians. Huneker no doubt believed Floyd Dell to be a Johnny-come-lately, and Polly’s café to be a big step down from Biily Moulds. Dell felt the same way about the over-priced sandwich shops that attracted Uptowners during the mid-nineteen-teens. WIsh I could try every restaurant these old New Yorkers praised and judge who had it right. Sadly, I don’t have a time machine. But at least I have Rose O’Neill to thank for inspiring me to visit these old epicurean rendezvouses on the page.